Uptown Aces Casino is a classic gaming destination, previously known as Desert Nights Casino. The rebranding came after a substantial face-lift. The new site has modern design, more games, and more bonuses. 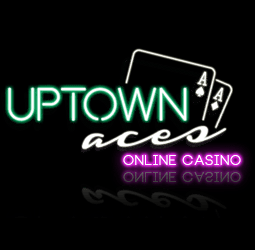 Uptown Aces Casino is the premier destination for casino bonus code; they offer various bonuses, all connected to temporary or permanent bonuses. The Games menu is stuffed with games, ranging from jackpots to video poker. There are hundreds of titles to choose from so players have plenty of options after downloading the Uptown Aces Casino software. There are titles from the newest generation but classic designs are also welcome on this site. The table game section is the home of blackjack, including sidebets, such as Perfect Pairs, Match Play 21, and Suit’ Em Up. Customers can also play reel titles should they have the desire to try something exciting and unique. Golden Retriever slot, Big Shot slot, Basketbull slot, Golden Lotus slot, Haunted Opera slot, Hidden Riches slot, Incan Goddess slot, Jackpot Pinatas slot, London Inspector slot, Lucky Last slot and other amazing title are all featured in the vast portfolio. When players join Uptown Aces Casino they will be rewarded with a sizeable welcome bonus package that stands at a jaw-dropping $8,888 and can be unlocked with six deposits. This will help the customers by giving them the necessary push through their gaming pursuits. There are also plenty of other lucrative promotional offers that players should watch out for on a daily/weekly/monthly basis. If customers have any pressing concerns of inquiries about anything regarding the site, they are free to contact the customer support team either by phone, live chat, email or even Skype. The support team always maintains to provide their expertise and assistance when called upon to help players solve their problems or concerns in a fast manner so that they can get back to playing their favorite games. 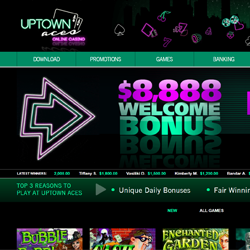 Uptown Aces Casino uses RealTime Gaming software. The system ensures that all of the services are provided to customers efficiently and are free of technical error. The games that can be found on the site are of the best quality in various ways all thanks to the powerful system. Uptown Aces Casino has some great Blackjack titles for its dedicated card enthusiasts. 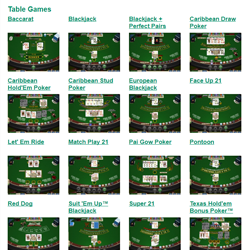 Some of the variations that can be found on the site are: regular Blackjack, Blackjack + Perfect Pairs, Face Up 21, Match Play 21 and Super 21 are just some of the great titles of Blackjack. Customers are urged to try their luck with some of the amazing casino games featured on the site. Baccarat, Caribbean Draw Poker, Pai GOw Poker, Pontoon, Tri Card Poker, Red Dog, Texas Hold’em Bonus Poker and may other games can be played on the popular Uptown Aces Casino. Players can also enjoy an assortment of slot titles. Some of the most exciting and rewarding are: Achilles slot, Builder Beaver slot, Coat of Arms slot, Coyote Cash slot, Fame and Fortune slot, Filed of Green slot, Green Light slot, Hen House slot, Jazz Time slot, King of Swing slot and other cool title. Customers can truly score some impressive bonuses that are released on a regular basis, therefore giving a chance to players to always earn a little extra. Considering the overall gaming services that customers have at their disposal, it is easy to see why Uptown Aces Casino has managed to become such a popular destination for dedicated players. It boasts all the relevant items that serious players look for in a casino; many games, huge bonuses, regular promos, great blackjack games, mobile capabilities and many other features. Uptown Aces Casino does not offer a live dealer games, but that is why the site more than makes up for it with plenty of other gaming options and bonuses. Uptown Aces Casino extends its services to mobile platforms as well, making sure players can also enjoy their favorite games wherever they go. Luckily for customers they don’t have to worry about compatibility, as the casino can be accessed on both iOS and Android devices.